Here's the way to develop a dial-on-demand database cluster in Linux. 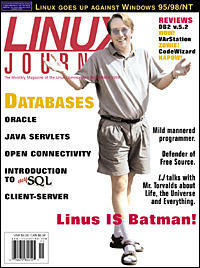 The persistent nature of Java servlets makes them ideal for database/web technology. Mr. McDonald takes a look at using servlets with PostgreSQL and JDBC. Mr. Harvey describes the ODBC open specification for application developers. A look at the MySQL database—where it's been, where it is now, and where it's going. Database Administration got you down? Here's a tool to help you out. A look at computational performance for an appoication running on an x86 CPU with Linux and Windows 95/98/NT, and how they compare. This personal tool to a popular Apache module is now in version 4 beta. A conversation with the man himself. The authors present a freely available tool for monitoring enterprise systems through simplicity toward complexity. A comprehensive look at the NoSQL database. This document explains how to build a database-backed web site using Apache, the php3 module and the PostgreSQL relational database. Using Linux and the ACEDB database system makes easy work of local area network management. Configuring Linux as a dual-purpose user environment. Linux is flourishing in Brazil. There is a Brazilian distribution, several high-traffic mailing lists, articles on mainstream newspapers and many users. Now, they have their first Linux User's Association. A step by step demonstration of the Oracle installation process.